The client was renovating a late Victorian home to include modern updates to the kitchen and bathrooms. Their goal was to add modern design elements within the vintage interior. They were keeping the fireplaces and woodwork original to the house, but wanted to have a blend of contemporary and antique options in the new interior design. 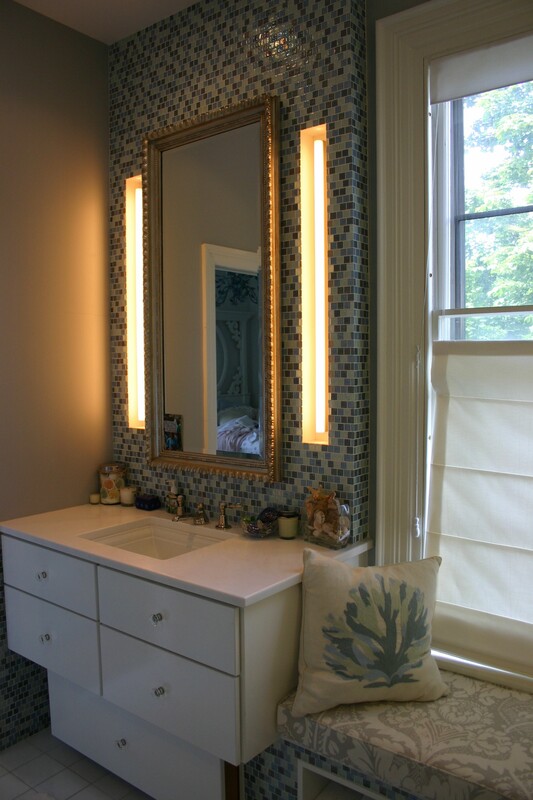 To work with the bathroom fixtures, the new backsplash tiles, and the accessories in the room, the client and designer chose a frame with a warm nickle finish to harmonize with the other color options. I developed this warm nickle finish several years ago while framing a painting by the artist Helen Nicolay. It is a lovely warm finish which brings out the warm side of silver or aluminum leaf while not becoming too gold. This frame used composition ornament for the patterning. We first milled and joined the frame to the exact specs on the architectural rendering. We even went to the site to check the measurements and to examine the distance the frame would be set above the sink hardware. It would be a real set back to build a medicine cabinet that you couldn’t open because it was set too close to the faucet! We built the face frame and the back frame at the same time. 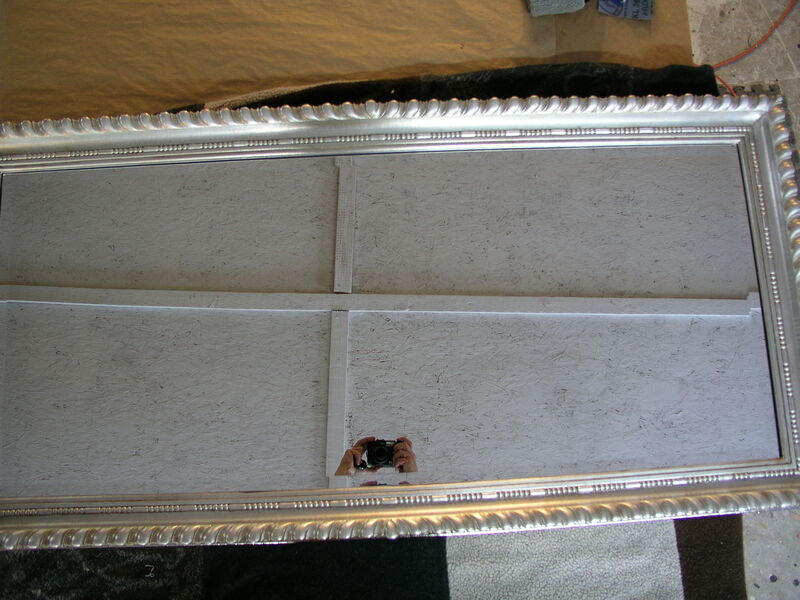 The back frame had to have enough width to be screwed into the casing which was inset into the wall. We routed out the left side of the frame along the vertical for the piano hinge which would be installed for the cabinet. The gadrooning pattern for the outer edge of the frame was placed on the frame beginning at the center of each rail and running in both directions from this point. This is a nice option to have as it makes a frame completely custom in design and execution. 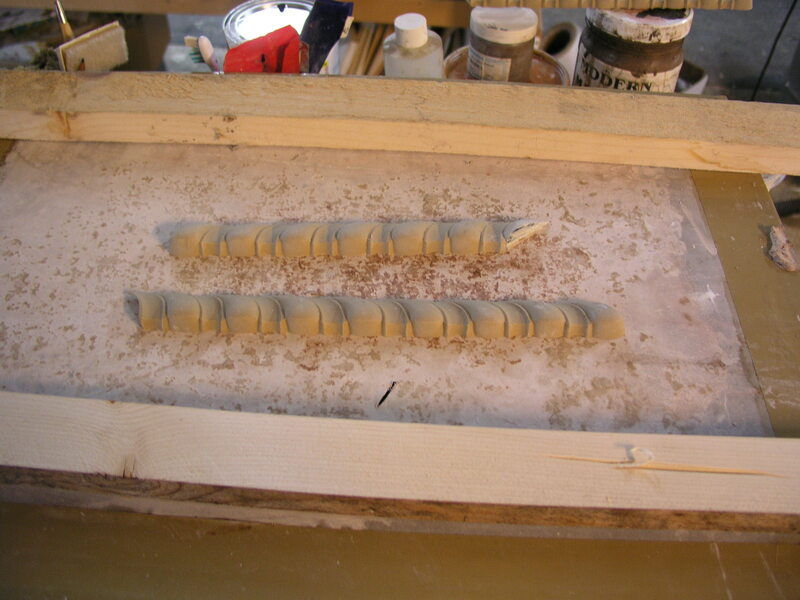 We had to mark the center points and, once steamed, layed the pattern accurately in both directions, going back after the ornament set up to form center designs in epoxy to match the gadrooning pattern. 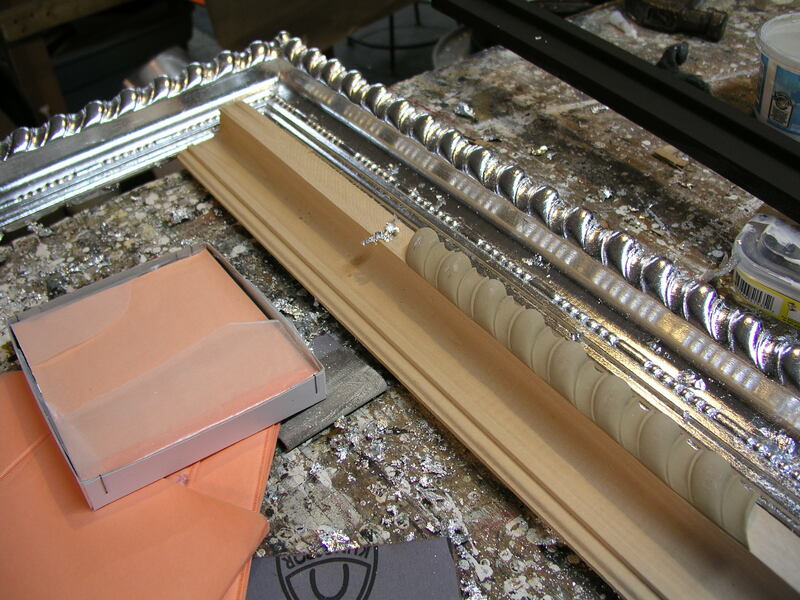 To give the frame a solid metal look, we applied two layers of aluminum leaf before we began toning it. As this medicine cabinet face was going to be installed in a bathroom, we made certain to allow ample time for drying at each stage of the process. To have the ornament still in a plastic state before gilding could result in mould formation in a humid bathroom environment. The medicine cabinet face installed and in use!